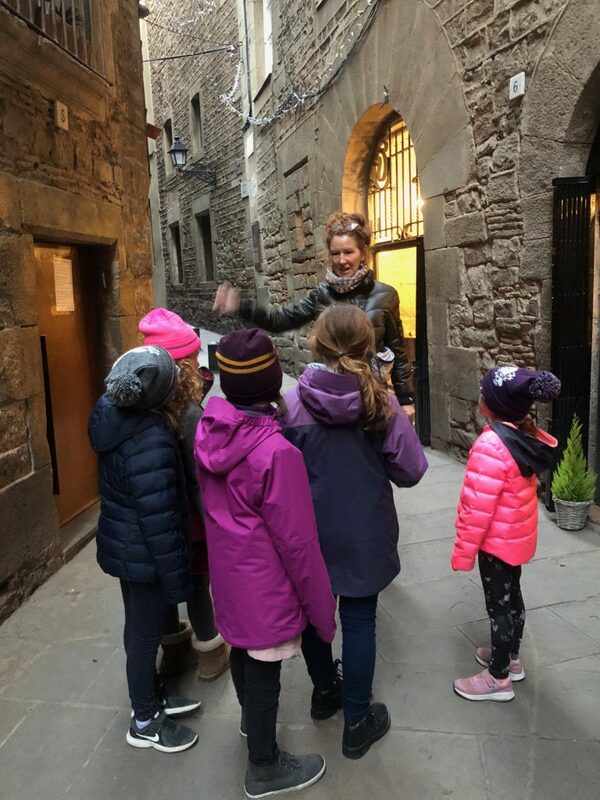 A few weekends ago I spent a beautiful, but abnormal chilly Saturday taking a kids’ walking tour of the Gothic Quarter here in Barcelona. My friend Nancy who has lived in Barcelona for 19 years runs and operates Enchanting Barcelona Tours, and ever since I’ve moved here we have been trying to schedule me on one of her tours. My kids happened to be busy this particular weekend so I enlisted a few of my favorite energetic young girls to take on the tour with me. I wanted to participate and experience the tour right alongside them. 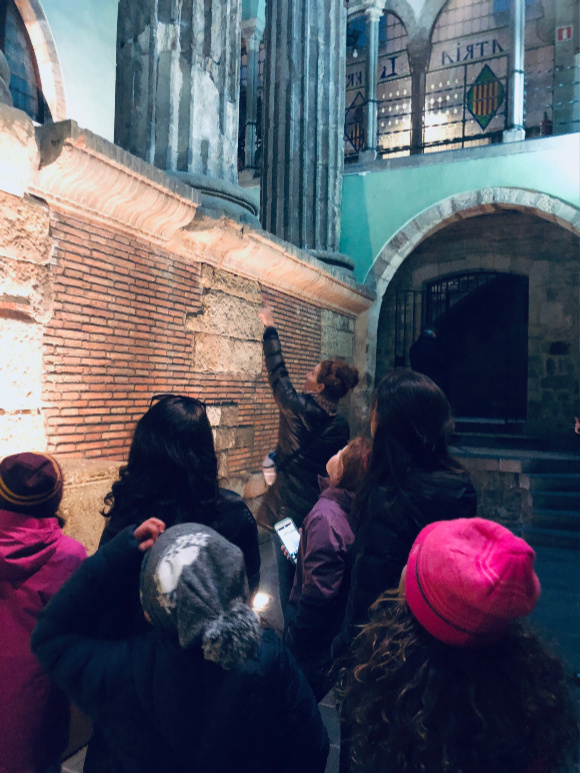 We met Nancy near the Barcelona Cathedral and after doing introductions and being shown a map of the old Roman city walls, she immediately captured the girls’ attention by telling them that we would also be going on a scavenger hunt. We had to pay close attention to her and be on the lookout for the list of items she provided and, to sweeten the pot, the winning team would be given a surprise at the end. We split into two teams, it was the five girls against the three moms and then we were off to explore! Now, with tours like this I don’t want to spoil all the fun by telling you everything that is included but I have been living in Barcelona for almost three years now and on this tour we went to a few places that I had never been to and we saw things that I have literally walked right past but had never even noticed before. This was a kids’ tour, but I clearly had quite a few things to learn as well. 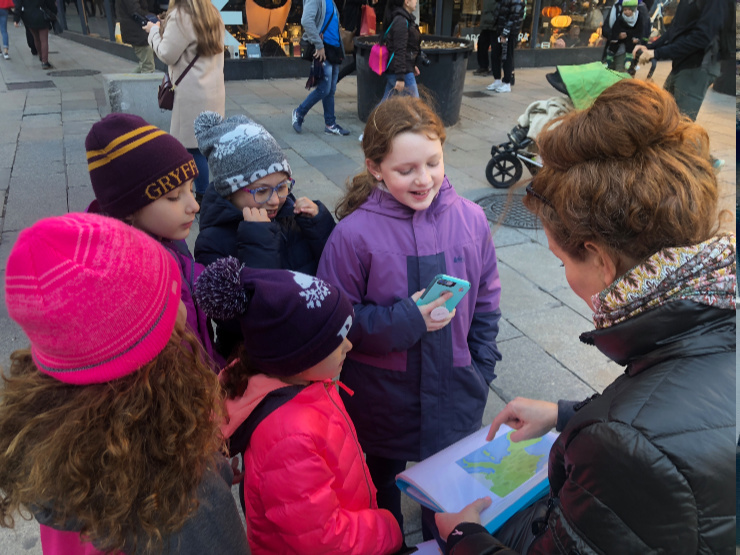 Time on this tour goes by so fast as Nancy has a real talent for keeping the kids engaged and answering all of their questions. I forgot how many questions young kids can ask! Nancy was able to answer all of them and add some colorful stories and fun facts in along the way. 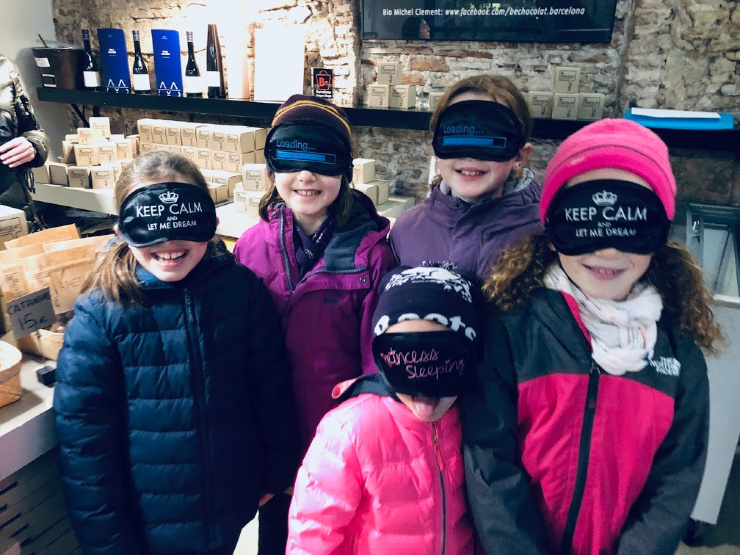 There was one surprise stop along the way that definitely made the girls happy – this was a fun pitstop where the girls had to taste different items covered in chocolate while blindfolded! 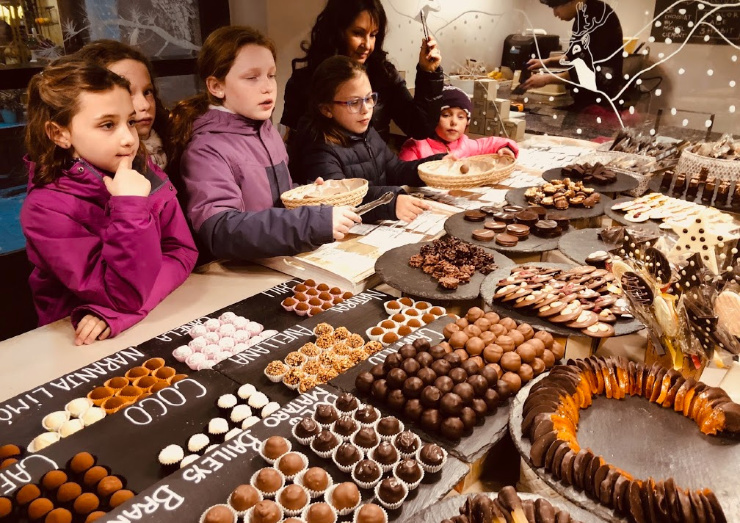 The tour lasts about three hours which includes sitting down at a charming cafe that was literally built into the side of the ancient Roman walls, to go over all our photos from the scavenger hunt and to declare the winner. The girls did happen to win, however, we all were able to get a sweet treat at the end. 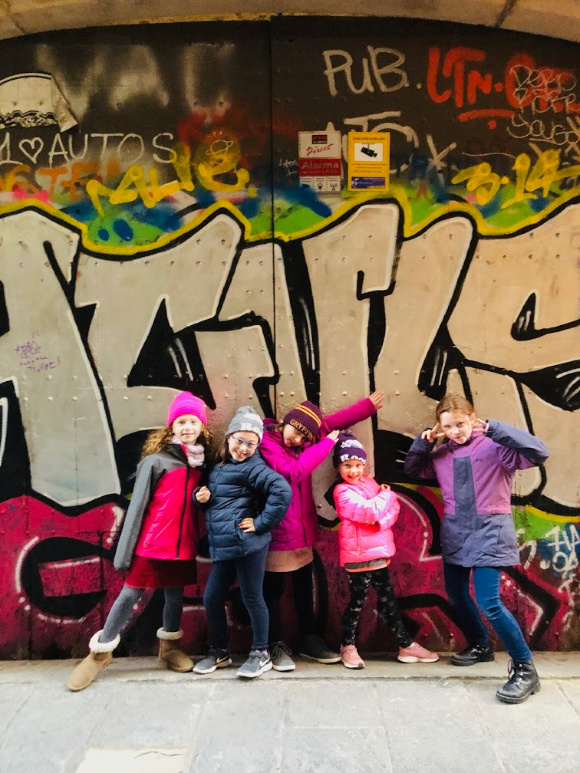 The girls on this tour ranged in ages from 7-10 and so the scavenger hunt was specifically designed for this age group. Nancy adapts her tours to the ages of the children so even if you have older tweens or teens she customizes the tour to make it age appropriate for them as well. 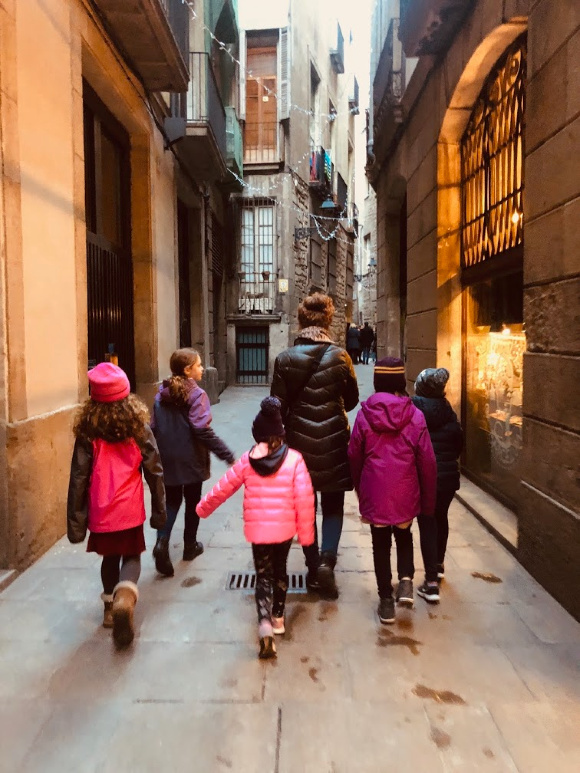 If you are coming to Barcelona with kids I highly recommend this walking tour of the Gothic Quarter, not only will your kids be engaged and have fun, but you will too! Nancy is an expert in the history and culture of Barcelona and her tour company offers a variety of walking tours in the city as well as day trips and other unique experiences. 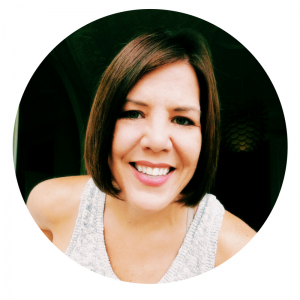 All of Nancy’s guides are local experts and engaging hosts with extensive knowledge of Barcelona. At the end of the tour, all the girls were asking when we could do another one! 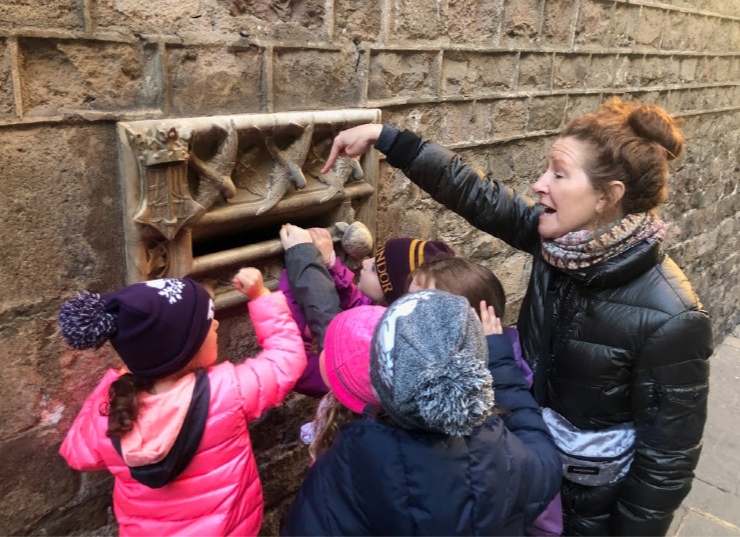 Nancy does have more kids tours, including a scavenger hunt in Park Guëll, which sounds fantastic – I just may have to make that happen! You can check out more of the tours that they offer over on their website. Disclosure: This tour was comped for me to engage in the experience and to be able to effectively write about it and decide if I would recommend it. My thoughts are always my own and I share this to help other families get the best Barcelona has to offer.